These are often called Coffin Flies. "To many afflicted Eastern fishermen, the 'Green Drake Hatch' is as irresistable and habit-forming as black jack, whiskey, or easy women." 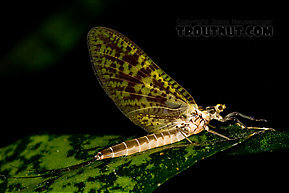 It is on par with the Midwest's Hexagenia limbata hatch for its ability to lure huge piscivorous (Piscivorous: Anything which eats primarily fish is a piscivore.) brown trout to eat insects at the surface once a year. The special charm of the Green Drake hatch is that it often takes place during pleasant Spring afternoons. It can be challenging because the large flies are easy for trout to inspect in the daylight and they feed very selectively, especially late in the hatch. The Green Drakes are on the decline due to environmental degradation. 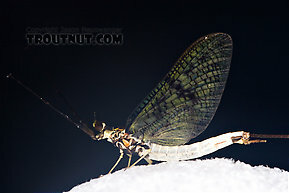 Male Ephemera guttulata (Green Drake) Mayfly Spinner View 12 PicturesThis spinner was the only member of its species I saw all night during an incredibly thick and tricky mixed hatch on Penn's Creek a few days before the real start of its famous green drake hatch. Piscivorous: Anything which eats primarily fish is a piscivore.